You are here: Home / Beauty & Fashion / Bride vs. 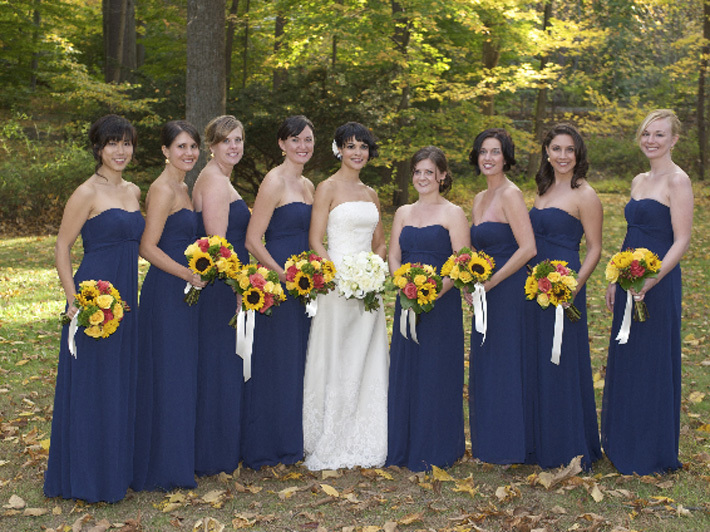 Bridal Party: How Coordinated Should They Be? 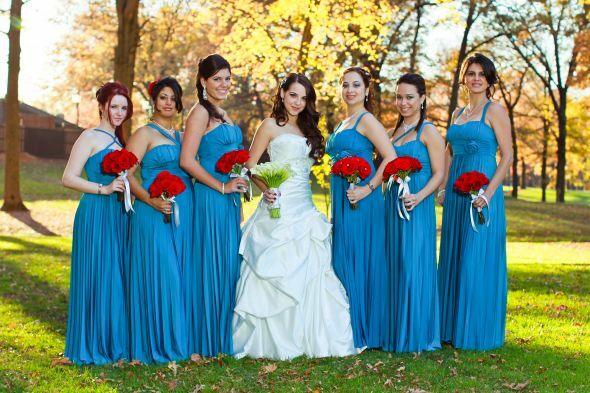 One of the most beautiful details to consider when planning a wedding is the overall look of your bridal party. 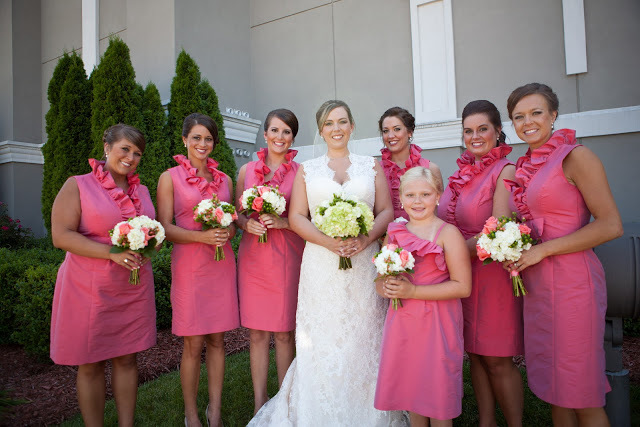 Most brides will choose to have some level of coordination for their bridal party (if for not for the entire wedding). The simplest and most common way to coordinate is by choosing a color scheme. Once you’ve done that then you can get down to the finer details of dress style, bouquet, accessories, hairstyle and shoes. 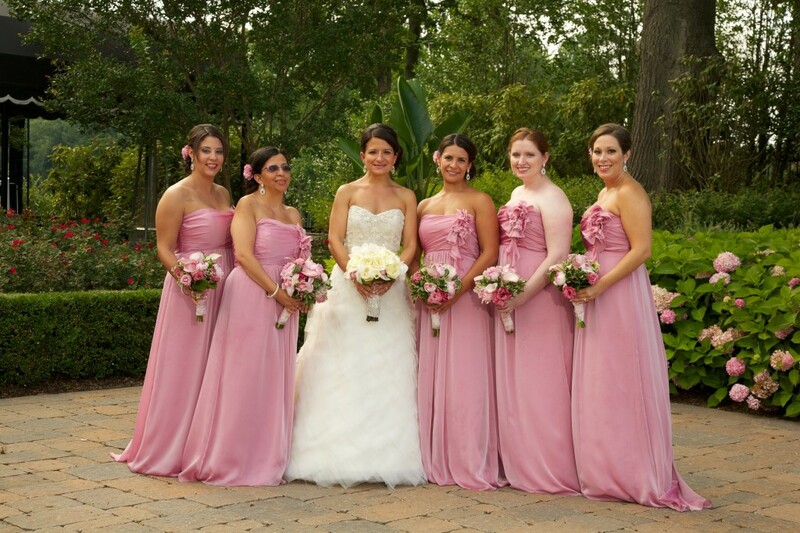 The next debate would be how well you want your own bridal look to match your bridal party. You could go very matchy-matchy, or take a more complementary approach – with a subtle link between your personal bridal look and the style you chose for your bridesmaids. 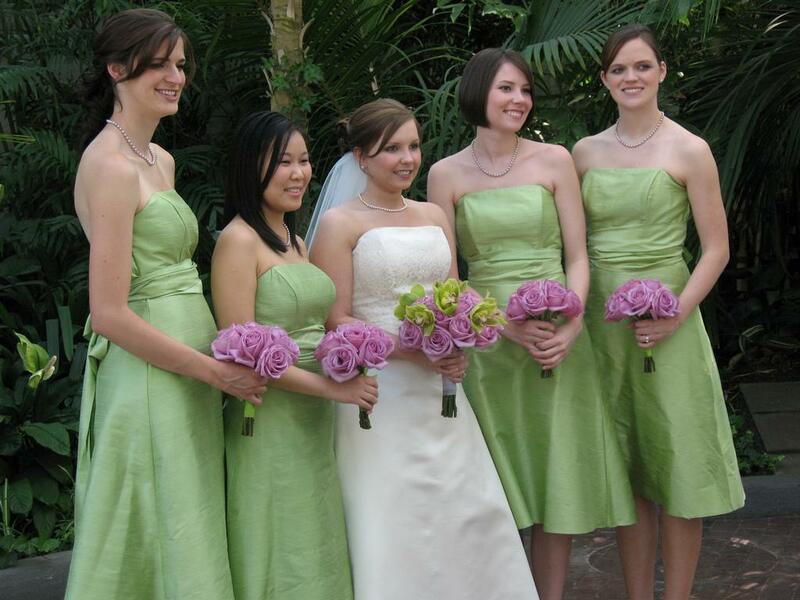 You may also decide not to have any obvious fashion link between you and your bridesmaids. Whichever way you’re leaning – here are some ideas to get you started. 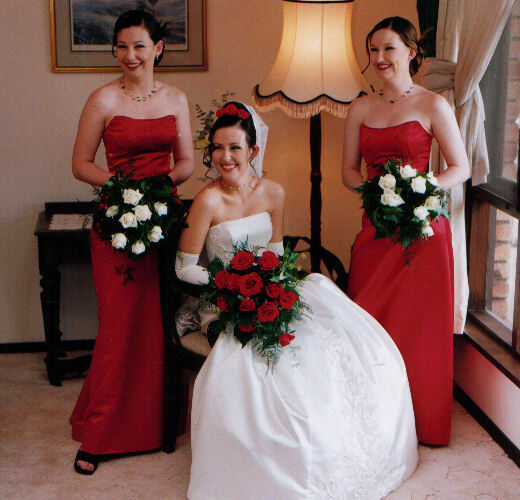 Another way of going, is keeping the bridesmaids looking unrelated to the bride. This could be on purpose, or for several other personal and/or logistic reasons. This approach definitely makes life easier for both bride and bridesmaids, since you are not limited in any way when choosing the dresses. Now that we’ve checked out both ends of the matching spectrum, let’s dive into the most common and interesting rout – the middle road. If you’ve ever watched a good runway show – a key component is to have it look like a cohesive collection, while not looking repetitive. 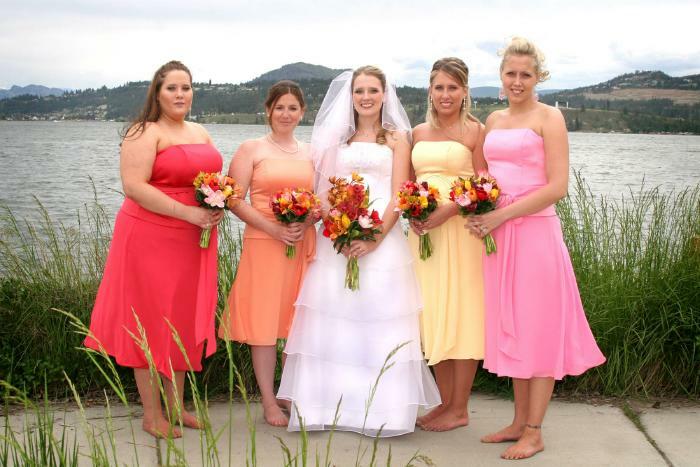 In this case you’d want to keep your bridesmaids from looking like a colorful clone of your own bridal look. However, if a stranger walked into a venue with a few weddings going on, he’d still know which bridesmaid goes with which bride. You will probably achieve the best results by having just a few perfectly matching elements and a few totally random elements, while leaving the rest to be complementary in one way or another. Once you’ve decided on the main part – the dresses, you can begin playing around with all the rest. 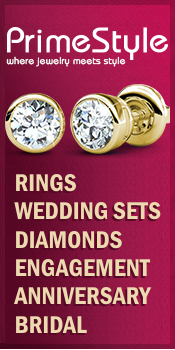 Accessorizing is a great way to complement each-other’s looks in a subtle way. Using your chosen accent color as a highlight, is a simple way to tie it all together. Accessorizing can also be useful budget-wise. As a bride, you may be interested in investing in quality accessories for yourself, but whoever’s paying for the bridesmaids accessories (either you or them), may not want to put out those sums, on top of the dresses. Going complementary could actually save you money! 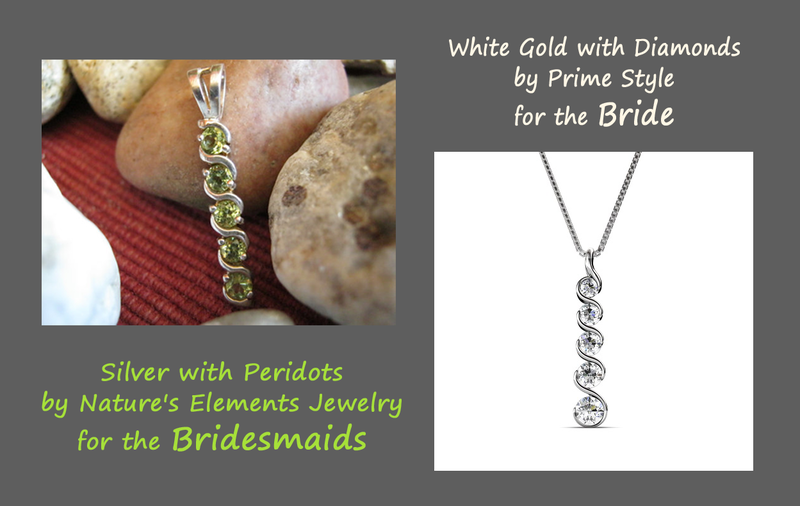 Here you have a real diamond journey pendant in white gold by PrimeStyle.com, and a nearly identical one in silver with green peridots, by Nature’s Elements Jewelry (on Etsy). This one’s an interesting issue, since it may be the most personal “imposition” you could make on your bridesmaids. For so many of us, or hair is a big part of our image, and a great hairstyle for one, can be hideous on another. Bring some whimsy to your all-white look and carry over that highlight color your bridesmaids are wearing. If you’re wearing a floor-length bridal gown, this will be a refreshing hint of color that will play peek-a-boo throughout your wedding. The other side of the coin is that your bridesmaids can have more leg room (pun intended) to wear shoes that are comfortable for them and that they can wear again. 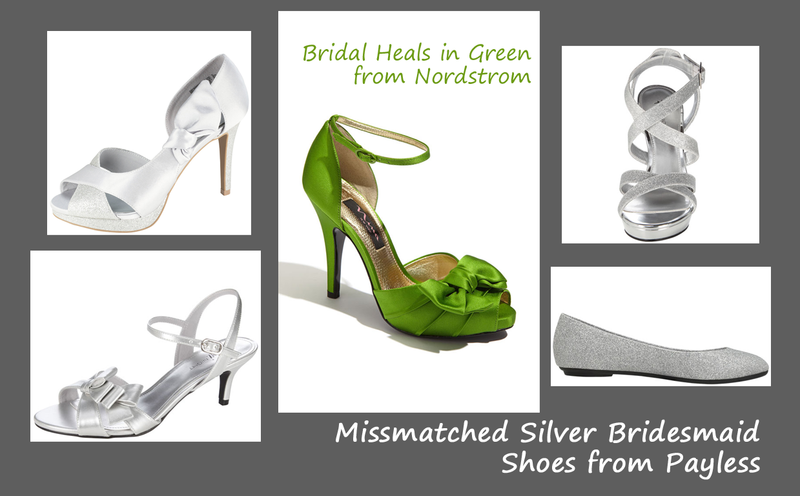 So how about having the bride wear these bright green heels, and let the bridesmaids find a shoe that works for them in a more neutral color – they may even own a suitable pair already . Last but definitely not least, the bouquets are probably the most noticeable factor in your overall looks after the dresses. They can do wonders in the final picturesque look of the bridal party. Let’s not forget that this may also be the only component that the groomsmen carry over in a literal way, when wearing a matching boutonniere. So it’s important to think the flowers through (especially if you plan to coordinate with your decorative floral arrangements at the hall). If you want a more cohesive look, you may want to keep the size and texture (i.e. type of flowers) to be similar or even the same. Then, within those parameters you can switch up the colors to make the bridal bouquet stand out more if you’d like. 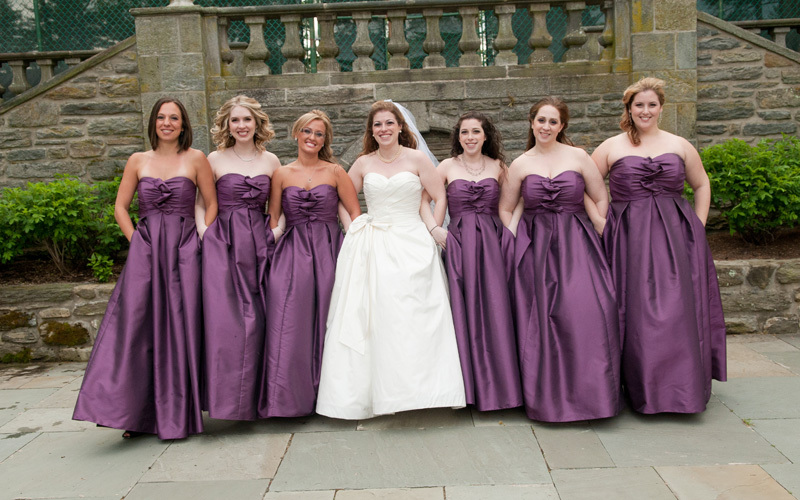 This bridal party went with the same concept, only in reverse – here the bridesmaids carry over the bridal color and the bride remains entirely white. Which do you like better? 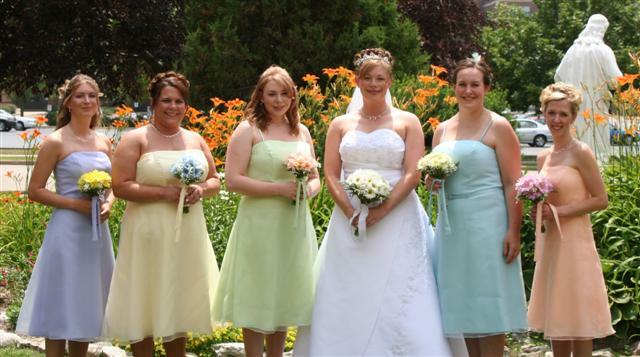 As you can see the following bridal party has mismatched most elements of their looks, even among the bridesmaids. Nonetheless, they look beautifully coordinated. I think what ties them together, is the muted tones of blue they chose, which blend so nicely. Their hairstyles are similar, and also, their fabrics, skirt shape and length are complementary – imagine these bridesmaid dresses in knee-length, and this picture may have ended up under my “hardly-matching” bridal party list. What I really love, are the bouquets. 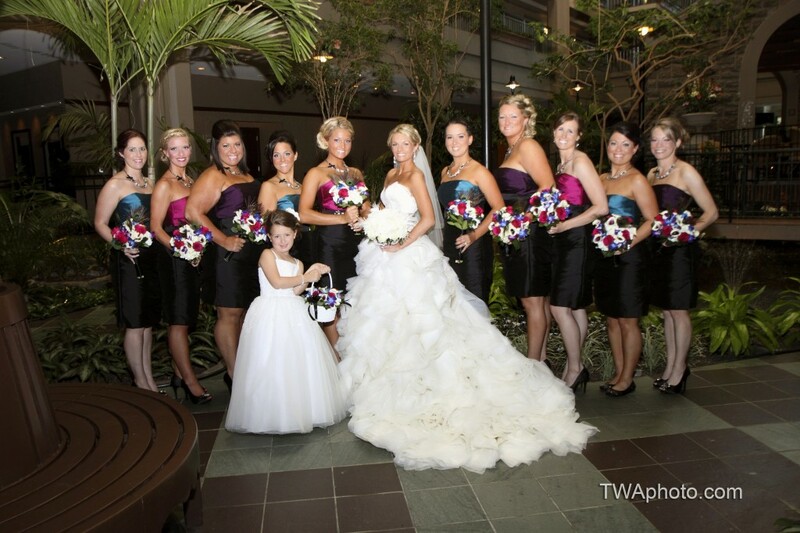 Each girl is holding a bouquet made of a different type of white flowers.